I grew up Baptist. When I was a child my mother took my sister and I to a little independent Baptist church not even a mile from our home. It was there that I was first introduced to the Lord's Supper. I observed it for sometime before I could actually participate in it myself. But after my conversion and subsequent baptism as a believer I found myself participating. At my little childhood church the Lord's Supper was observed the first Sunday of each month (if my memory serves me well at this moment). We did the supper at the end of a typical service. Men would pass out the bread (a little stale cracker) first and we would eat it together. Then they would pass out the wine in little cups. Now, I don't mean wine in the symbolic sense. We used the real thing! That's right. The first time alcohol passed over my lips was as a minor in church. It was a strange juxtaposition of biblical literalness and fundamentalist Christianity. The church used real wine because that's what Jesus used. However, as conservative Baptists and heirs of the temperance movement we promoted teetotalism as the proper Christian lifestyle. I can still remember a friend who got into trouble for finishing off the leftovers after a service down in the basement kitchen like he was throwing back shots at a bar. I digress. After we had finished receiving the elements, then we would sing a hymn. I remember while we sang the pastor would walk to the back. When we finished the last note he would say, "and after they had sung a hymn, they went out." Then we would leave. I believe that I had a decent understanding of what we were doing in the Lord's Supper even as a child. However, I'm not sure that I was ever led to have a significant appreciation for it. It always felt like an add on, an afterthought. It never felt like it was the point of a service. I came to realize over time through experience and some education that the de-emphais on the Lord's Supper in some Protestant traditions (including mine) is largely due to the anti-Catholic sentiment that has pervaded them. I can vividly recall having the impression as a youngster within my Baptist circle that being Roman Catholic was much worse than being an outright heathen. This is understandable for two reasons. First, Protestants and Catholics fought like cats and dogs for centuries creating generations of animosity and suspicion. Secondly, the official teachings of the Roman Catholic Church constitute a different gospel that is false. Their errors include a message of salvation that is based on the performance of sacramental works. Although there are seven sacraments for the faithful, the Lord's Supper (called the Eucharist among Catholics) is the most important. It is observed every week and by some every day. It is the means by which Christ gives His grace to sinners. It is also considered to be literal. The Catholic Church teaches that the bread and wine are literally transformed in their substance into the body and blood of Christ once it has been consecrated by the priest. It's easy to understand why my tradition would go out of its way to avoid looking, feeling, or acting in any way Catholic. Although, I do reject Roman Catholic teaching about the Lord's Supper, I do not want to throw the proverbial baby out with the bath water. In classic historical overreaction, I think we Baptists have diminished the significance of the Lord's Table. Jesus clearly told his disciples to repeat the memorial he created together regularly until He returned. He wanted them to remember together. I've had to work as a pastor to make the Lord's Supper more significant in my own life. I've had to personally strive to connect with Jesus' intent in instituting it for His church and to discern what spiritual benefit God intends for His people through it. Sadly, I've had to prod myself to care more about the Lord's Supper as a leader in the church. At FBC Hazard we observe the Lord's Supper once each quarter. We may observe it a couple more times on special occasions - in all, around 5-6 times each year. That's not very often. I remember being told that the reason we Baptists didn't observe the supper each Sunday is because we didn't want to lose its special quality with too much familiarity (like those Catholics!). By, the way I live next door to a Catholic church and the priest and I are friends...just in case you were wondering. No hating here. I digress again. However, I couldn't discern much special about the supper even in our less frequent observances. As a pastor I'm trying to put more emphasis on the supper on the Sunday's that we do observe it. I'm committed now to make sure we always do it in prime time on Sunday morning. I'm also committed to making everything about the service move toward the climax of observing the supper and partaking of the elements. I will still give a message, but that message will connect to the significance of the Lord's Supper for the corporate life of the church. It's one of the few times I depart from my expository march through the book I'm preaching through. My hope is that by the time the elements are in the hands of believer's that their hearts and minds are saturated with an awareness of what they are doing and why. In the end, I want all of our affections to be warmed again for Christ. I believe when I do the best I can to help believer's truly pause and remember, the result is that they filled even more deeply with love and gratitude for the One who gave Himself for them. I hope that you will join me as a Protestant who cherishes the Lord's Supper. There is nothing magical or even supernatural in the memorial, but it is spiritually significant when we approach it as such. I just completed reading Jerome Dean Mahaffey's The Accidental Revolutionary: George Whitefield and the Creation of America (Baylor Press, 2011). First I want to say it was a good read. Mahaffey has a pleasing style and keeps the book moving at a nice pace. It's a quick read (192 pages), but long enough to get you well acquainted with Whitefield. Whitefield is one of my favorite characters from colonial American history. He was the first American celebrity, known throughout the colonies via his preaching and newspapers. He attracted massive crowds, introduced innovations in preaching that we take for granted today, was controversial, interdenominational before there was such a thing, and has to be the most odd Anglican preacher in history. He is truly a fascinating character. If you know little of Whitefield, you need to read this book. What most interests me about this book is the thesis that Mahaffey picks up. His argument is not a new one. Alan Heimert first argued for a causative relationship between the Great Awakening (in which Whitefield was a primary leader) and the American Revolution in his 1966 book Religion and the American Mind, from the Great Awakening to the Revolution. Mahaffey essentially repackages this idea in his treatment of Whitefield and I think he makes some points worth consideration. An interesting yet elusive question for historians is this: How much did religious ideas inform and shape the dissent among American colonists from 1760-1776 and the eventual push for separation from England? Mahaffey wants to ascribe considerable influence to revivalistic evangelical Christianity in general, and to George Whitefield in particular. It's an intriguing connection, but is this the historical reality? If you read Mahaffey you may be convinced that he and Heimert are on to something. 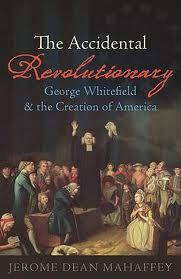 With the evidence he gives from Whitefield's preaching, you may easily draw the conclusion that religious ideas in his preaching ultimately translated into political ideas that motivated the colonists to revolution. However, I think this may be just an appearance and not a cause. Another possibility is that philosophical and political ideas were invading and shaping Christianity in subtle and progressive ways. So, that by the time we arrive at the Revolution many religious figures and political figures have a great deal of vocabulary and ideas in common. One influence that Mahaffey does not, in my opinion, give sufficient credit to is the influence of Enlightenment thinkers of the post-Reformation period. Protestant Christianity still dominated the English-speaking world, but it was a Christianity under the influence of the Enlightenment or at least in engagement with it. Some Christians rejected many aspects of the Enlightenment and some allowed its ideas to transform traditional views into new categories (e.g. Deism and Unitarianism). Many more I believe found something new in a kind of fusion of Enlightenment and Christian ideas that seemed compatible. I believe that there can be no doubt about the presence and influence of Protestant Christianity during the founding period of the United States. However, the question I continue to wrestle with is to what degree that influence may have been. The more I look into it, the more I see Enlightenment influence as well, especially on many of those who were primary political shapers. I certainly don't think it is an either/or choice. It's a matter of figuring out which influence was primary and which one was secondary. It's a matter of discerning which had a greater shaping influence on the other. Let me also invite you to read Christian America? Perspectives on Our Religious Heritage. I had the privilege to conceive, edit and contribute to this work. 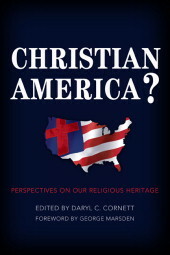 The contributors offer different interpretations about the influence of Christianity during America's founding. I think its an important and interesting discussion. Seeing our past more clearly, helps us understand why things are the way they are now. And, I believe helps us chart a more intelligent and faithful approach to impacting our culture now. I hope you'll give it a read. You won't agree with much of it guaranteed, but that is sort of the point. It's a conversation of different voices on the subject interacting with one another. I invite you to make your own evaluation and join the conversation. I really like the word purpose. According to Merriam-Webster’s (11th ed.) purpose is “something set up as an object or end to be attained.” That is pretty easy to grasp. Every business and organization has a purpose, whether it is well articulated or not. In other words, as the church, what is our target? And maybe a better question is this: How do we know if we are hitting it or not? The purpose of the church is to make disciples of Jesus Christ. This is the “something” that is our “object.” Notice that there are many things that are not the purpose of the church. The purpose of our church is not simply to get bigger. Our purpose is not to minister to all needy people in the community. Our purpose is not to worship. Now, understand all these and much more are important activities in the overall life of the church, but none are the purpose. It’s important that we always make sure the purpose drives the activity in a focused way because it’s easy to slip into the mentality that the activity is the purpose. Before you know it, the proverbial tail is wagging the dog! The problem with getting our eyes fixated on particular activities is that we all like different things. One person may like benevolent work, another may like in-depth Bible study, another may like exciting worship, another may like choir and special music programs, another may be passionate about missions, and so forth. That’s not bad; it’s actually good. We are attracted to different aspects of ministry because God gifts us with different interests and abilities. But we are often tempted to define the church’s purpose in accordance with our giftedness. This can be subtle, but it’s significant! Even the preacher can fall into this spiritual narcissism in which he thinks his preaching is the most important and defining activity of the church. Although the proclamation of the Word is vital and it needs to be done well, it's still not the purpose of the church even if it plays a role in fulfilling it. The purpose of the church doesn’t change, just as the gospel doesn’t change and God doesn’t change. Jesus told us to “Go and make disicples…teaching them to observe all that I commanded.” Our purpose is to invite, lead, and instruct people on how to be disciples of Jesus. So, how do we know if we are successfully doing this? We must ask another question: What does a growing, true disciple of Jesus look like? A genuine disciple of Jesus is one who is learning to love God, love people, and give of himself or herself to serve God and others. This is where the activity comes into play. Every specific activity we have from worship, to Sunday school and small groups, to missions works is a part of being disciples and making disciples. Over the years, culture, methods, and styles change, but the purpose of the church remains firmly tethered to the Great Commission. Disciple making is two-fold. First, every Christian is in the process of becoming a disciple. I recall when Ignatius was being led to Rome to be executed for his faith in Christ that he wrote in one of his letters that he was just beginning to learn to be Jesus' disciple. What! He's giving his life as a martyr and he says that he's just beginning to learn? What an incredible statement. It's important that we understand that we are all in the process of being disciples - a process of growth that doesn't end. We ourselves must be growing to know and love God more as time goes on and to love others better. Second, as we ourselves should be in a pattern of growth as a disciple, we are helping others in their growth as disciples. This includes our participation in evangelism, worship, instruction, mentoring, nurturing, or simply lending a hand where it's needed. We are called to be a disciple, and we are commanded to help make disciples. And even as we put ourselves out there to help others through purposeful disciple making, we ourselves are growing as a disciple. True disciples participate in helping to make other disciples! What are the implications of all this? I think that it is vital that pastors and lay leaders work diligently together to make sure that the purpose of disciple making is always the point. Every church has to decide what activities it will attempt to provide. I mean, you have to do something. But that something should be purposeful. You should be able to explain clearly why you do what you do, and that explanation should have something to do with making disciples. If we do this, it will most certainly mean that we may have to stop doing some things merely out of tradition or simply because that's just the way we've always done it. If the activity doesn't have a view toward making disciples, then it's just a distraction and a waste of time and resources. If it doesn't serve the purpose, then it ought to go and make room for better-focused activity. I think that I'm learning that one of the most important aspects of my leadership is helping all of us keep our attention on the purpose of the church. I'm also finding that this takes time, especially in a long-established church with strong tradition. However, if you keep chipping away over time, more and more folks will start to get it. As a pastor, make sure you can clearly articulate purpose to the people. And then bit by bit begin to implement,eliminate, or modify activities to be focused on the purpose. Be patient. Don't throw people off the boat by trying to turn it too quickly! And lastly, get used to repeating yourself - let purpose become your spiritual stump speech.